This lesson introduces forecasters to the orthometric and tidal datums used to describe tropical cyclone storm surge measurements and forecasts. It provides a general overview of how to interpret storm surge forecasts using various vertical datums. Very interesting and informative module! I didn't realize there was a whole 'course' on the Storm Surge problem ... what fun on a rainy afternoon! Good knowledge base on datums. Extremely helpful in understanding surge. Very interesting lesson, useful and supplementary to "Introduction to Tropical Cyclone Storm Surge". I just would like to mention an omission, Chapter Tides and Datums: the chart which precises the type and area of tides around the world is incomplete. There is no data around the Atlantic European coasts, where amplitudes are up to several meters (15 meters near to Mont Saint Michel (France!) contrary to the Mediterranean Sea where amplitudes are generally up to only a few tenths of centimeters (With the notable exception of Gulf of Gabes, Tunisia and near Venice, Italy). 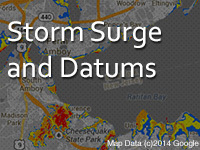 Convey storm surge guidance using the datum preferred by partners. datums, vertical datums, geodetic datum, tidal datum, storm surge, forecasts. 10/03 made www.tidesandcurrents.noaa.gov an active link. Changed "right" to left in the image description on the "Converting between Datums".